About the Children's Hospital Foundation | Norton Children's Louisville, Ky. The Children’s Hospital Foundation is the philanthropic arm for Norton Children’s Hospital, Kentucky’s only full-service, free-standing hospital created “Just for Kids.” The Children’s Hospital Foundation raises funds exclusively for Norton Children’s Hospital and its sister facilities to provide equipment, new technologies, clinical research, child advocacy and health education for patients, families, medical staff and the community. Norton Children’s Hospital is ready to help children and their families in virtually any medical situation. It serves all families regardless of their ability to pay. As a not-for-profit organization, Norton Children’s facilities rely on the generosity of the community to help fulfill our mission to provide for the physical and emotional health of children, from birth to adulthood. It takes the generosity of everyone in the community to enable Norton Children’s to be here for all children — if and when they need it. The Children’s Hospital Foundation exclusively raises funds to support programs, equipment and facilities, research, advocacy and education at Norton Children’s Hospital, Norton Children’s Medical Center and Norton Women’s & Children’s Hospital. Thanks to donations from the community in 2016, the Children’s Hospital Foundation was able to provide more than $13 million to drive innovation and support the needs of Norton Children’s Hospital and its sister facilities, which serve nearly 170,000 children annually from throughout Kentucky and Southern Indiana. Why should I support Norton Children’s Hospital? Norton Children’s Hospital is not-for-profit and relies on the generosity of the community to support programs, hospital improvements, education and advocacy. Norton Children’s Hospital cares for children regardless of their families’ ability to pay. As the number of children needing help at Norton Children’s Hospital continues to increase, so does the need to stay up-to-date on medical advances and technologies. Norton Children’s Hospital cares for children from birth to adulthood. We know that children require smaller equipment, different medications and, sometimes, different doctors. Our clinical staff is trained to provide the special kind of care children need and deserve. Access to health care is very important to a community’s quality of life. Having a full-service pediatric hospital is important to the region’s economy as governmental leaders seek to attract new businesses and, in turn, those employers attract new employees. Children’s hospitals across the country are facing a shortage of pediatric specialists. Those with access to greater resources to provide funding for equipment and research also tend to have greater interest from specialists. Having these specialists at Norton Children’s Hospital means that families do not have to travel outside of the region when their children need medical care. Support the fundraising arm for adult services at Norton Healthcare. 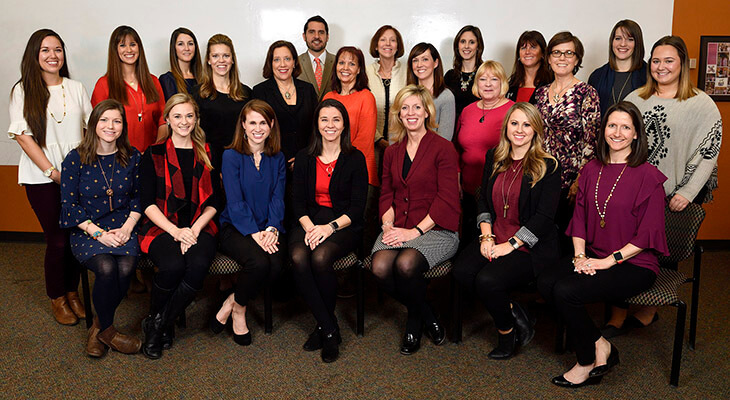 Norton Healthcare Foundation and Children’s Hospital Foundation team.